Richly graduated hues of color on a woven texture create an appealing backdrop for your photos or artwork. Most shapes in this highly accessible, all-purpose style have a window for your uploaded images. With over twenty colors and eleven fonts to choose from, Simple Edge makes it extra easy and fun to personalize your labels, tags, coasters, invitations and more... Customize your Simple Edge purim coasters today! Simple Edge Purim coasters are available in multiple shapes—3.9" round, or 3.9" square with rounded corners, and others. They are created on extra-thick 58-point paper board. To give you an idea of how thick they are, a bundle of twelve coasters is about 3/4" tall. They are made of absorbent pulpboard to help protect your tabletops. The Purim coaster surface is finished with a smooth matte coating to provide a beautiful, crisp printing. Purim coasters are individually die-cut, so their top edge is soft and curved. 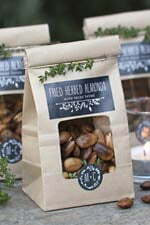 They are designed to be disposable, but they are durable and can be reused. 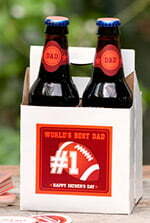 If unused, they can be set aside as keepsakes and will last forever. 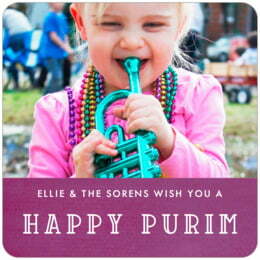 Purim coasters are printed on one side only. On the blank back, a small Evermine logo is tastefully debossed (not printed with ink, but simply pressed into the soft pulpboard paper). Simple Edge Purim coasters come beautifully packaged in boxed sets of a dozen. 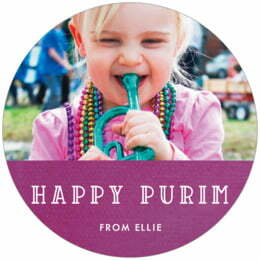 Choose the "Personalize" button to begin customizing your Simple Edge Purim coasters today.